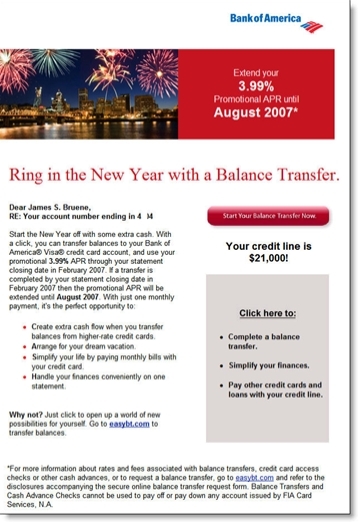 Here's a timely email from Bank of America, inviting its credit card customers to start the year off with a 3.99% balance-transfer offer. But the savings won't last long, since the rate resets after August 2007. Subject: Use your Bank of America® credit card today. Boeing Employees Credit Union email: "BECU Gift Cards Make the Perfect Holiday Gift"
Boeing Employees Credit Union <becu.org> starts the holiday shopping season off with an email pitch for its prepaid MasterCard gift card. At $2.50 each, they are a bit less expensive than one hanging in Safeway for $4.95. However, the CU neglected to disclose dormant account fees, a significant issue with consumer advocates. It's too bad you can't order the cards online. Ideally, members should be able to order with a single click (or two) right from within the online banking function. Maybe next year. Even if gift cards cannot be ordered online, the credit union should include a link or URL for more information. 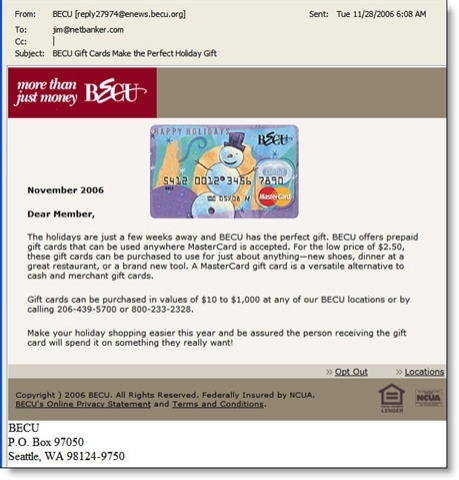 Since many email recipients will automatically go to BECU's website to purchase, it would be helpful to specifically mention the cards cannot be ordered online, and why. The opt-out and CAN-SPAM disclosures could be better designed. Add disclosures for any monthly fees that kick in if the value is not used by a certain date. More than 70% of business-email users view most or all of their email messages in the preview pane. * Depending on screen size, resolution, and window sizing, the real estate available in the preview pane can be relatively small. When designing messages, be sure to put the most important information in the upper-left corner to maximize visibility in the preview pane. Even though it's just a routing email message, the poor layout makes it look like a phishing message. Chase could clean this up with just a few minutes of programming work. While they are at it, they should add a personal greeting and additional text disclosures to make it look less phishy. *For more information, read our Online Banking Report #129/139, Email Marketing for Financial Services. How do you convince already-registered users to sign up for your latest email newsletter? One way is to offer an incentive. Earlier this week, the Seattle Supersonics offered users the chance to win a $500 shopping spree if they logged into their account and opted-in for the latest email newsletter. 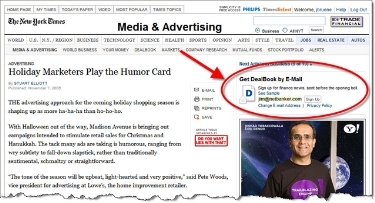 An even more effective method was demonstrated by the New York Times today in the online version of its Business Section. In the upper-right corner, the user's existing email address is shown, along with a sign-up button (see screenshot below). All it takes is a single click to begin receiving the daily DealBook email. Once users click on the sign-up button, the text is changed to a thank-you message along with a link to change email preferences (see inset above). 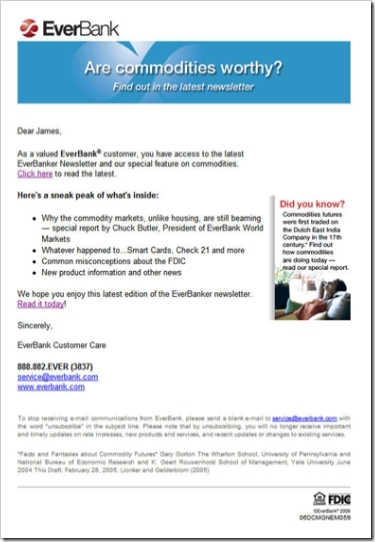 Everbank <everbank.com> has been an active emailer, sending a newsletter every few months for the seven years I've maintained an account there. The newsletters have always been chock full of content, from general finance topics to detailed discussions revolving around the bank's unique currency- and commodity-related products. The newsletter design has evolved with the times, from plain text in the 1990s to the well-designed HTML missive we received last night (see below). 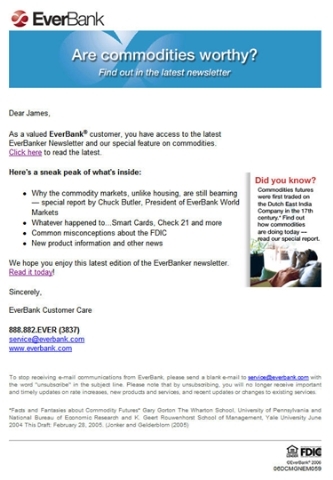 The short headlines letter encourages customers to click through and read the full document at the Everbank website (see End Notes). There is little to criticize. The short email is direct and to the point. Its layout lends itself well to viewing within the preview pane. The small "did you know" box adds an element of interest, and the drop-shadow makes it stand out. With four major articles, it makes sense to send just the headlines and ask the reader to click through to the website to read the full article. However, the bank should use the standard convention of hyperlinking each article directly to the appropriate place on the website. The bank does include two hyperlinks to the Web-based newsletter, a "click here" in the first paragraph and a "read it today" at the end. However, for even better usability, the bank should add a big shiny button that leads directly to the Web version. The website demonstrates good usability in its layout and content. A synopsis of each article is provided on the main page and users click through to read the complete article. It's useful and well-written information, better than a lot of what you read in mainstream consumer-finance publications. We especially liked the "whatever happened to" look-back at some recent initiatives, such as Check 21, and the overview of consumer-protection laws. As good as the newsletter is, we couldn't stop thinking that it would work much better as a blog. That way, readers could pursue subject threads and more easily peruse all that Everbank provides. The bank could also experiment with accepting comments to make the whole experience more interactive. Click on the following link to see a screenshot of the newsletter landing page. 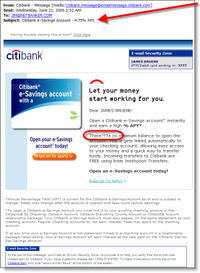 Last night, Citibank sent selected checking-account customers an email solicitation for its 4.75% APR e-Savings account. I live outside its branch network, so Citi may have elected not to send the message to customers serviced by traditional branches. The message was direct and to the point (click on screenshot left). Citibank even included the impressive 4.75% interest rate in the message subject. The only distracting portion of the message was a garbled first word in the second paragraph. It was probably caused by incompatibilities in software rendering of the apostrophe in the first word, "there's." To avoid this type of error, make sure you proof your message in multiple email clients. 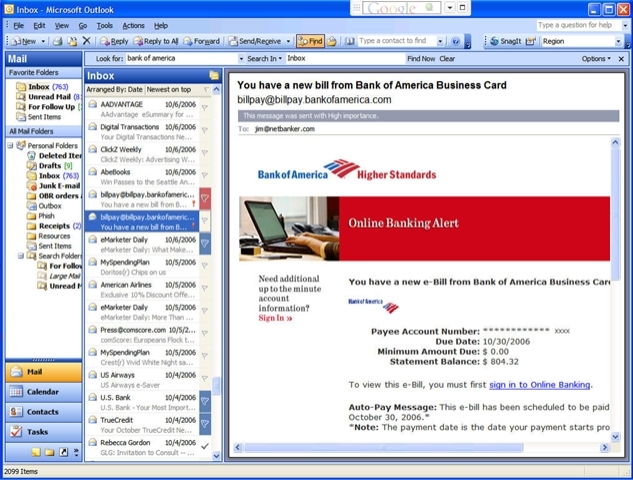 The bank continues to engender trust in its marketing messages by including the "email security" box in the upper-right corner which includes the customer's full name and last four digits of their ATM card. 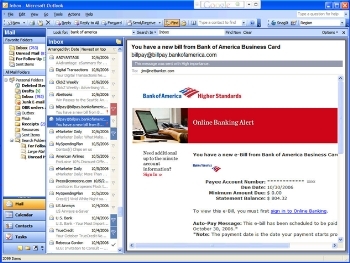 The security information is prominently displayed, in a blue shaded box to make it more prominent, even if the user has images blocked (see screenshot below). The bank also includes short text messages that appear where the images would have been displayed (alt-text tags) making the message relatively readable even for users that never download the images. 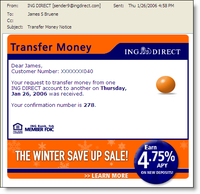 Email: US Bank "Spring Clean Your Finances"
Every month we receive dozens of emails from the many financial institutions where we have accounts and also, increasingly, from non-customer mailing lists at others. As part of our expanded coverage of email marketing, we plan to post many of them here. You will be able to access the entire sample collection by clicking on the "Email Archives" subject on the right-hand navigation. Alternatively, individual emails will also be filed within their pertinent product areas, in this example, "Loans & Credit" and "Personal Financial Management." Today's message is from US Bank <usbank.com>, which sent the following solid, but fairly boring financial organization email to current customers. When your customer makes a significant purchase or signs up for online banking, make sure you take the time to send a well-designed welcome/thank-you email message. It not only helps make a good impression with your new customer, but also can pay for itself by decreasing telephone inquiries about the status of the new account. 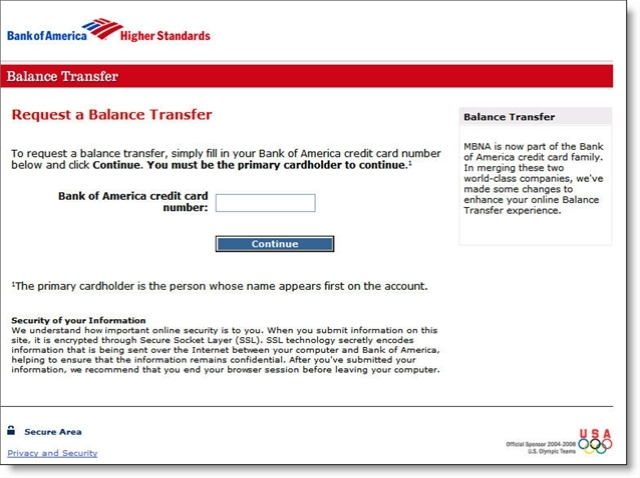 The message can also be used for SUBTLE upselling, such as a balance transfer offer for new credit card accounts. 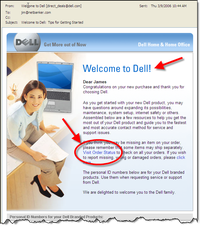 Today we received this message from Dell thanking us for purchasing a new PC. 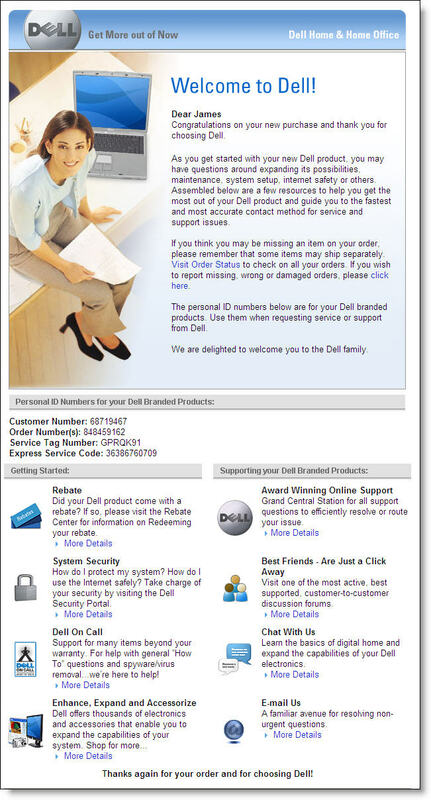 Even though we've been frequent Dell buyers for years, they are not taking us for granted. The welcome message includes friendly graphics and a short welcome message with an embedded link to the "order status" page (click on inset left for a closeup). The bottom of the message, which requires scrolling for most users, contains key information for future use such as serial number, customer number, support numbers, rebate info and so on. 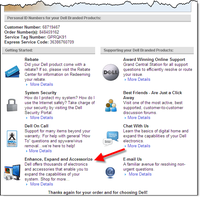 There is also a link to purchase add-ons (click on inset right for a closeup). Click here to download the entire email message on one screenshot. It appears the pay-for-delivery email model could be gaining traction with announcements by Yahoo and AOL that they plan to start levying fees of $2.50 to $10 per thousand for guaranteed delivery. According to emarketing guru Anne Holland, who believes that these fees are inevitable, the cost to send email will roughly double for most large mailers. 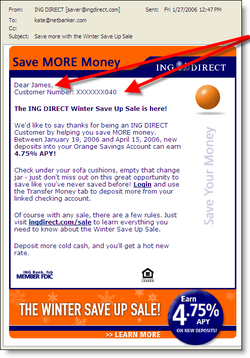 ING Direct <ingdirect.com> is the latest bank to move to greater personalization in order to distinguish its messages from phony phishing attempts. The bank has added the customer's first name and masked all but the last three digits of the customer's number (click on inset for a closer look). The message at left was sent to customers to market ING's latest deposit promotion: 4.75 percent APR for new money. The same technique is also used for routine account alerts (see inset right). Note: The high-impact sales pitch for its 4.75 percent deposit promotion. While it doesn't prevent phishers from attempting to recreate the same look (see footnote), it's an effective first line of defense. Besides, the personalized greeting is a friendler way to communicate with customers. 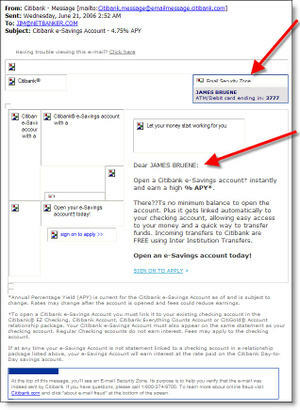 Citibank has been using a similar approach for more than a year (FMW, May 30, 2005). 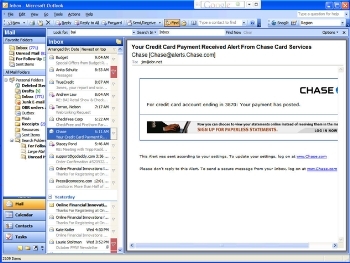 Footnote: Yesterday, we received a fake email that recreated the Citibank personalized area in the upper-right corner. The crooks just left blank the Email Security Zone in the upper-right corner, figuring many users won't look that closely at the box (click on inset for a closer look).